Ralph's Coffee neon on the second flood of the Ralph Lauren flagship store. The in-store café used to be the exclusive purview of chain booksellers, expensive salons & swanky department stores — you could get an egg cream from the Woolworth’s soda counter, a glass of decaf while your dye set, stale scones at Borders. We’ve been noticing a new trend in the types of places you can eat while you shop lately, so Put A Egg On It decided to tour several of these spots in NYC, and we found their origin stories as varied as their offerings. Some are entrepreneurs teaming up to combat space issues and bonkers rent, while the larger chains are offering snacks to set themselves apart or up foot traffic. At Rose Bakery inside Dover Street Market, both businesses are owned by Comme des Garçons under the umbrella of their department store concept. Their strawberry donut is swoony (don’t try to take it near the clothes, though). When we tried to order the mint Arnold Palmer, our server Luke informed us that Wiz Khalifa and his crew had come by the day before and finished their entire stash. So it seems like these spots might be part of a larger post-recession trend toward diversified skillsets and unlikely partnerships. Perhaps convenience is entering the realm of the discerning customer, rendering simple storefronts one-stop-shops to appeal to the journeywomen and Renaissance men of today. Maybe when we buy a donut beside a $75 tube of face cream, we’re merely witnessing the boutique analog of the big box store! Tastier than Target popcorn, if you ask us. 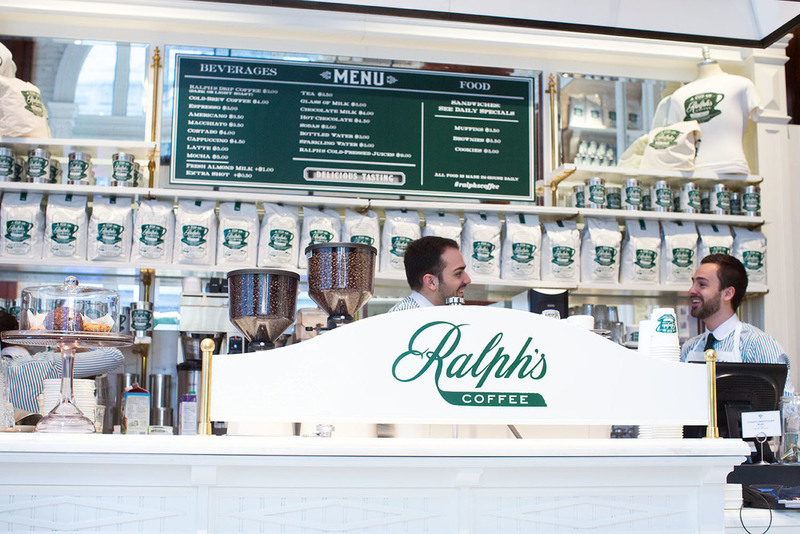 Ralph's Coffee, 2nd Floor at Ralph Lauren, 711 5th Ave, New York. Brooklyn's Fine + Raw makes the Ralph's chocolate bars with a dash of sea salt. They are really nice. Black Gold Records sells used records, antiques and coffee in Carrol Gardens. Grade Coffee inside Fellow Barber's Williamsburg location. While there, I got a smooth espresso and a nice haircut. Grade Coffee focuses on espresso, with only a couple snacks to go with. Grade Coffee inside Fellow Barber, 101 N. 8th Street. At McNally Jackson in Nolita, you can sit and read and work and even get a book printed. The salads are quite good and so is the tea. The coffee shop inside McNally Jackson, 52 Prince St, New York. Molasses Books in Bushwick has a great selection of used books and some pleasant places to sit while you drink coffee and beer and write poetry all day. Molasses Books, 770 Hart St, Brooklyn. Persons of Interest Barber Shop with a Parlor Coffee outpost in the back. Claire, a barista at Parlor Coffee, makes us an Americano. Parlor Coffee is roasted in nearby Bedford-Stuyvesant. Parlor Coffee at Persons of Interest, 84 Havemeyer Street, Brooklyn. A coffee counter tucked in behind the surfboards at Saturdays NYC in Soho. On nice days, nothing beats grabbing a brownie, a coffee and a magazine at Saturdays and relaxing in their spacious backyard. Saturdays NYC, 31 Crosby Street, New York. Grabbing a snack at Rose Bakery is a welcome moment of quiet while wandering through the many floors of amazing clothes at the Dover Street Market. Try the matcha cake and the egg sandwiches are fantastic. Rose Bakery at Dover Street Market, 160 Lexington Ave, New York.